The Yelagin Palace is, without doubt, classed among the most attractive monuments and most charming memories bequeathed to us from the epoch of Alexander I. The palace is situated on one of the islands of the mouth of the Neva which has always been a favorite promenade place of Petersburgers for its picturesque site, park, ponds and a superb view of the Gulf of Finland. Under Peter the Great the island was called "Michael's Island". During Peter's reign the site of the palace was occupied by a villa belonging to an official of the Imperial Court, Vice Chancellor Chafirov. Later, during the reign of Catherine the Great, the villa passed into the hands of A. P. Melgounov, who fell in love with the island for its promenades and atmosphere of peace and quiet. Melgounov used the villa as a palace to receive aristocratic guests and the beau-monde in splendor. One party he gave in 1776 was the object of a poem bt the famous Russian poet, Derjavine. The name the palace has been borrowed from one of the famous courtesans of Empress Catherine II, J. Yelagin for whom this isle was called during the time of the Tsars. Today the island is called Stone Island. In 1817 Emperor Alexander I bought the isle from its last owner, Count Orlov and the following year engaged the architect Rossi to reconstruct the palace for the Dowager Empress Marie Feodorovna. The palace is among the greatest works of Charles Rossi, who after a stay of 12 years in Moscow and much fame for his neo-classical designs there, received an Imperial invitation to work in St. Petersburg. Rossi was born in Naples, but grew up in St. Petersburg where his mother, was a popular dancer in the Imperial Ballet. Returning to Italy he studied classical art and architecture for two years at the Academy of Florence. In 1806 he returned to Russia and settled in Moscow where made a significant contribution to the creation of the Russian Empire style. In Petersburg, the task which had been confided to him by the Alexander I for the new Yelagin Palace was not the easiest. 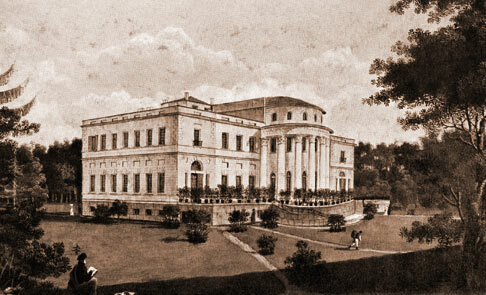 The new palace was intended for Alexander's mother, the Empress Marie Feodorovna, who was known to have extremely refined and demanding tastes. His orders where to construct a new palace, using as much of the original structure as he could and updating all of the palace support systems, such as the kitchens. Working with an existing structure could have restricted Rossi's creativity, but he surpassed all expectations. Despite his southern origins, he had understood and sensed the unique charms of the severe northern climate of St.Petersburg with its short, yet intense, summers. He created a complex of elegant buildings with chaste yet regal facades; which appear equally beautiful in both winter and summer. The interiors are among the most charming of their era. All of this splendor was very expensive, costing almost 1,300,000 rubles, a princely sum in those times. Alexander I decided to extend the project over several years to reduce the impact of the construction costs. Work started in 1818, and exterior work was completed four years later, in June 1822. During the exterior work at Yelagin, Alexander I was so pleased with the results that he commissioned Rossi in April 1819 to design a palace for his brother, Grand Duke Michael. Today this palace houses the Russian Museum. Later, in January 1820, Alexander I also asked Rossi to create the great arc of neo-classical buildings which frame the opposite side of the Winter Palace Square. The construction of these mammoth projects cost 6 and 8 million rubles respectively.